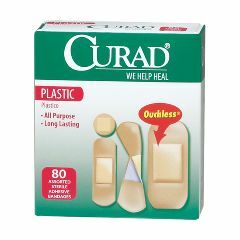 All CURAD Bandages have a skin-friendly adhesive that doesn't leave a sticky, itchy residue on the skin, providing comfort as you heal. CURAD Plastic Strips are made from soft, flexible plastic for maximum comfort as you heal. Ideal for everyday use. 80 per box/24 boxes per case. Latex Free. 20 small 3/4 x 2 1/8"
30 standard 3/4 x 2 7/8"
10 large 1 1/8 x 2 7/8"
I haven't opened the box yet. Better price than local drug or grocery stores.